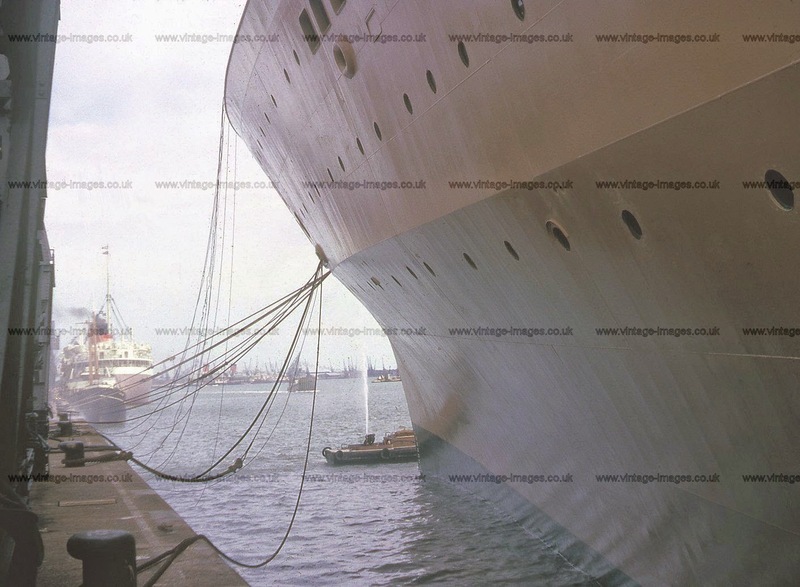 Southampton Docks in May 1963. Liners still cover the globe with regular Transatlantic cossings by Cunard, Union Castle liners sailing to South Africa and the Orient Steam Navigation Company to Australia. The latter two lines are seen here. The huge bulk of the 1959 built SS Oriana looms in the foreground with an unidentified Union Castle ship with its lilac coloured hull sits ahead. The funnels of what may be the Queen Elizabeth can be seen in the distance. Union Castle Line would soldier on until 1977 on the South African run, the Australian route of the Orient Steam Navigation Co. having ceased in 1974. Cunard had stopped regular Transatlantic crossings in the late 1960s with the withdrawal in 1967 of the Queen Mary and the Queen Elizabeth in 1968. The QE2 would still make the crossing, but the regular weekly sailings would be a thing of the past. Air travel making the travel across the globe quicker, although not nearly as comfortable. All this was a few years away but with the demise of long distance travel by ship purely for travel needs, the ships were converted for cruising as the shipping lines still had to make their ships pay their way (and ships are very expensive things to run). Cruising is now the main reason for travel by sea now, although for those that cannot travel by air, Cunard still does run a liner from Southampton to New York on a semi-regular basis, the Queen Mary 2 is the last liner built for North Atlantic conditions - and I can testify it is really the ONLY way to cross the Atlantic.